the back were brought by Andre Siegel from Germany. 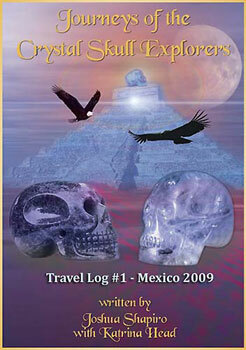 What is the Crystal Skull World Mission Conference? This Conference has been organized and supported by three organizations located in Europe. The Heyyanka Foundation located in Courtemaiche, Switzerland offered their facilities to host the event, Jan and Uschi Ackermann are the founders. The second organization to sponsor this event is the World Mystery Research Center located in the U.S. and Holland, the founder is Joshua Shapiro. And the last organization is IKA International, in Germany, with founder Boris Schneickert. 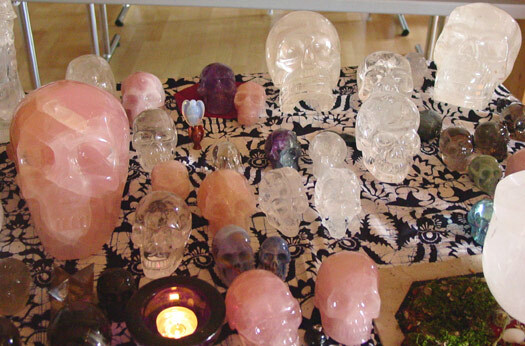 The Goal: Is to provide a space for a weekend, where people involved with the crystal skulls (caretakers/guardians, researchers, carvers, teachers and people interested) could meet in an informal setting to share their knowledge and their crystal skulls with each other. The first gathering was held in August of 2004 and a second conference occurred again in August of 2005. ( Kristallen Schedels komen "samen" naar jou toe!! The Crystal Skulls come together to meet with you!! Lastly, it is our hope that through the creations of these various types of events that we will be able to eventually create a new organization that will be a network of individuals and groups working closely with the crystal skulls who will be able to work together in the future on joint projects involving the skulls that will benefit people all over the world. A Summary of the Activities that happen in Switzerland: The Crystal Skull World Mission conferences are a combination of talks by the participants, live music, some hands-on work with the crystal skulls present, various meditations for world peace and time for people to make new friends and connections. In 2004, we had about 30 people attend representing six countries (Australia, England, Holland, Germany, Switzerland and the U.S.) and we probably had over 50 crystal skulls present. Not all the participates had their own crystal skull. In 2005, we had about 25 participants representing various countries and again had a large collection of skulls including a few from the Mayans of Guatemala. If you would like to see what happened at our first meeting, we have setup a few webpages of photographs taken during the conference by some of our participants. To take a front row seat and join those of us who were able to particpate in Switzerland just click on the link below. Enjoy!! If you would like to help organize a Crystal Skull World Mission Conference in your local area, feel free to contact us.